How to survive! That was the unending worry for the villagers of Preston in the nineteenth century. Wages for farm workers fluctuated from low to extremely low. The silver lining in the clouds was that family finances were underpinned by the straw plaiting of women and children. 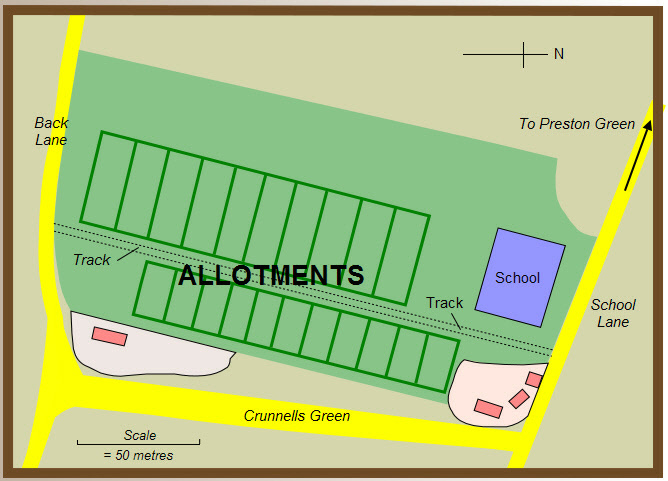 There was also a third source of sustenance for Preston folk – the allotments at Crunnells Green. I have found four references to allotments at Preston in the nineteenth century. The first explains that on Monday, 22 April 1874, the Hitchin land surveyor, George Beaver (1810 - 1896), ‘set out a scheme of allotment gardens in a field at Preston named “California” - the property of Henry M Pryoor Esq’. The sale particulars of Temple Dinsley indicates their location, the rent received from them and their area – 6 acres and 30 perches. The sketch map of Preston of 1884 confirms the location of the ‘field gardens’ and suggests how many were available to the villagers. Finally, the ‘Doomsday Survey’ of 1910 for the Inland Revenue mentions allotments owned by RDV Pryor and its accompanying map of 1898 shows a track or path dividing the plot. Allotments were small areas of land set aside to allow the poor to grow vegetables and fruit. They were an important part of villagers’ life as they reduced poverty and were a source of fresh food. Some of the upper classes believed that the plots also improved morals as grafting in them kept labourers from public houses and encouraged a work ethic. also as nature does not loiter for anyone and several of their crops ripened at the same time when the harvest was being gathered. One would like to think that a communal spirit at Preston was enhanced at the allotments as villagers worked their patches shoulder-to-shoulder with their neighbours. wages for agricultural workers which jeopardized their meagre standard of living. It may well have been the benevolence of the Darton family at Temple Dinsley which impelled them to dedicate land for the Preston allotments – they had certainly showed their concern for village folk by other projects such as the provision of a school, church and a well in the 1800s. The allotments were on a field which was owned by the Dartons. 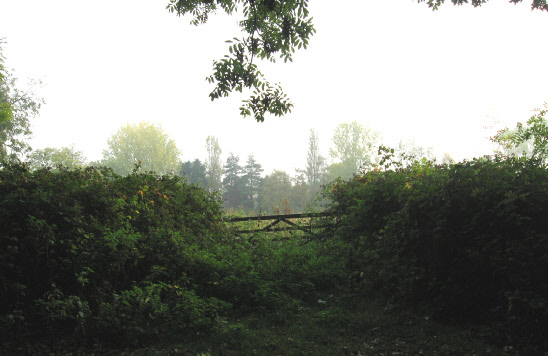 area of six acres and thirty-seven perches which was owned by the ‘Hitchin Poor’ and occupied by John Foot. The size of each allotment can only be estimated. The 1884 sketch map shows 20 or so field gardens. However, in 1873, the annual rent received from them was £15. A typical annual rent for a plot was ten shillings (sometimes payable by instalments). If this was the arrangement in Preston, there would have been thirty allotments. The customary size of field gardens was between 250-300 square yards - but the six acres of land (almost 30,000 square yards) set aside in Preston for allotments may indicate that the village’s plots were considerably larger. To show the importance to the villagers of the allotments, in 1881 there were less than 50 households in the vicinity of Crunnells Green. If there were 30 plots, then about two thirds of Preston’s households would have tended an allotment. No doubt, on a golden summer’s night, as the Dartons drove home in their carriage, it would have given them great satisfaction to see the villagers reaping their hard-earned harvest. The allotments were still shown on a map of Preston dated 1945.